China has developed some specific methods of coal mining and experimental techniques under aquifers and surface water. Over the last 40 years, about 1000 longwall faces were extracted under surface and ground water, liberating millions of tons of coal reserves without disastrous consequences. Since coal extraction enhances hydraulic conductivity, it is desirable to determine accurately pre- and post-mining hydraulic conductivities in the overburden strata. To measure these conductivities, boreholes are drilled pre- and post-mining either on the surface or in underground observing roadways. The flow rate or circulation loss along the borehole during drilling is measured by pumping drilling mud into the borehole. Well logs are also applicable for the determination of mining induced fractures and permeability changes (Peng et al. 2002a). (3) Severely fractured subzone. Most of the strata have been fractured, and the fractures are interconnected. Hydraulic conductivity in the strata increases dramatically. The circulation loss rates are greater than 1.0 l/s m.
Field observations by circulation loss measurements in boreholes while drilling have shown that the strata failure characteristics differ considerably for different inclinations of the extracted seams. 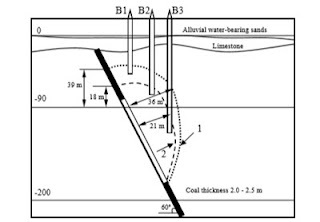 For flat or slightly inclined coal seams (the dip angle, D < 30q), the profile of the water-conducting fractured zone is broad in section with extended lobes over the headgate and tailgate, as shown in Fig. 9.2. For strong rocks, the failure zone has a different characteristic, as shown in Fig. 9.3, which is that the failure zones are much higher in the vertical direction and narrower in section. For inclined coal seams (30q< 60q), failures zones propagate upwards in an asymmetric manner in the upseam direction as shown in Fig. 9.4. The extents of the failure zones reduce gradually from updip to downdip. For steeply inclined coal seams (60q< D < 90q), the failure zones occur not only in the overlying and underlying strata, but also in the steeply inclined coal seam. Rubble originating updip is displaced downseam by its gravity, causing much larger failure zone in the upseam (refer to Fig. 9.5). A considerable number of in-situ observations have shown that heights of strata caved and fractured zones in the overburden formation depend primarily on the lithology and strength of the overlying strata, as well as the inclination of the extracted seam. The following formulae have been obtained according to in-situ observations in thousands of longwall faces (Liu et al. 1981, Bai and Elsworth 1990, Zhang and Shen 2004). For mining under aquifers, it is desirable to avoid the extra expense of strata dewatering. This can only be achieved when aquifers are located outside the water-conducting fractured zone. In this case, water inflow into the mine workings does not increase. When an aquifer lies within the fractured zone, but outside the caved zone, excessive groundwater discharge to the mine occurs (according to the mining experiences in China); however, the sand in the unconsolidated aquifer does not flow into the mining area. When an unconsolidated aquifer is situated within the caved zone, both water and sand can rush into the mining area, and this may even cause disastrous consequences, if the aquifer is very permeable and strongly waterbearing. The Daliuta coal mine, affiliated with the Shenhua Group, is located in ShenFu Coalfield, Northern Shaanxi Province and on the southwestern bank of the Yellow River, Northern China (Fig. 9.7). It is one of the major coal mines in China. This coalfield consists of nearly flat-lying beds of Jurassic coal measure. The thickness of the primary coal seam, No. 2, is approximately 4 m with the roof consisting of medium-grained sandstones. The overlying coal measures are 19 to 65 m in thickness, comprising weak, weathered strata in the uppermost reaches. The bedrock is overlain by unconsolidated alluvium comprising mixed impermeable clay layers with water-bearing sands and gravels. The alluvium is generally 38 to 43.4 m in thickness, in which one aquifer underlies lowermost in the unconsolidated overburden. The total depth of cover for seam No. 2 ranges approximately from 20 to 100 m. Comprehensive mechanized longwall mining with full caving is used in the coal extraction. The coalfield has a very dry temperate climate and is situated in the southeastern border of the Maowusu Desert. Most of the surface is covered by sand, in which little vegetation exists. The water resource is very precious in this region. Only one perched aquifer in the Quaternary alluvium overlies directly on the coal measure. Therefore, the protection of the water resource and mining safety from groundwater hazards are common concerns of both the mine operator and government.